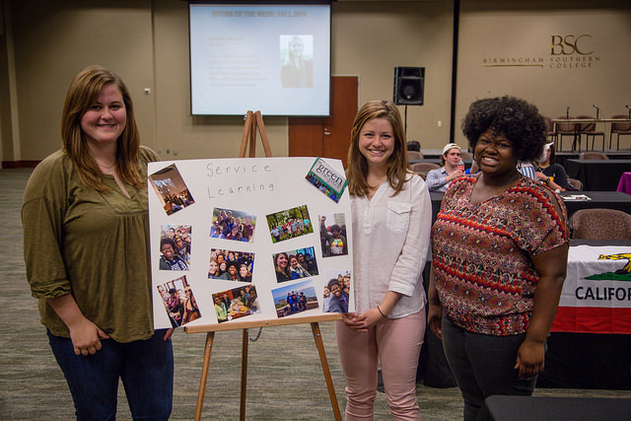 Three of our experiential learning students at a campus-wide event this past Spring! I’ve contributed to the Student Affairs Collective a handful of times, but I don’t think I’ve ever truly introduced myself. My name is Kimberly White and I serve as the Internship Coordinator at Birmingham-Southern College, as well as a BSC Campus Advisor to the Alabama Alpha chapter of the Pi Beta Phi Fraternity for Women. Our internship program involves academic internships (both for-credit and not-for-credit), and lives under the rise3 Initiative, an experiential learning opportunity in the domains of faculty-student research, internships, and service-learning. One of the major projects that I’ll be working on this summer and into the fall is developing a campus-wide leadership and professionalism conference for both current and prospective interns, and I have been tasked with building the framework for our internship program over the past year, since I took on the position in June. Each day varies widely for me, as my position requires constant collaboration with students, other professionals, faculty, and community partners, but I do my best to provide a sense of structure to an average day. Doing this provides me the opportunity to block out time in my schedule to consider strategic planning, support our Director, work on side projects for our office, and take care of unscheduled drop-ins and meetings. A typical day for me involves time for reflection and reading in the morning with meetings scheduled throughout the day. I get into the office at around 7am, and work on creating my to-do list, tackling “moving parts” of different projects, and doing some reading and reflecting on leadership theories and approaches. If possible, I block out 7-9am to tackle my to-do list, read, and reflect over coffee. It’s not always easy for me to accomplish this, particularly in the middle of the term, but reflecting even for 10 or 15 minutes in the morning informs my practice and approach in so many positive ways. Once I’ve taken this time for myself, students will begin to stop by my office or my faculty/staff meetings will begin. I’ll have a handful of 30-minute advising appointments with prospective interns, catch up with current and past interns, or have the ladies of Pi Beta Phi stop by to chat with me during their office hours (Wednesdays 3-4) or at another time. I also will have 3-4 meetings with community partners during the week to discuss internship opportunities, so these will often times take me off campus. If I have a meeting with a partner, I often block out an hour and a half in the late morning or late afternoon to travel and meet with them. The rest of my time is divided between answering e-mails, doing strategic planning, and following up with faculty and students engaged in internship programs. It’s a full day! While this may seem like a typical day for me, my schedule truly ebbs and flows throughout the year. 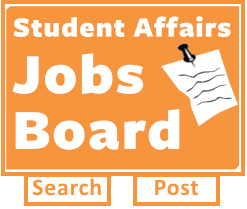 Peak times for internship advising appointments are typically in late August-late September and late March-late April, and internship site visits for the fall and spring take up the bulk of my time in early November and early April. Our brand-new Leadership Conference debuts this October, so more of my energy that month will be devoted to event planning and management. I’m always working on ways to better optimize my time, and figure out which projects will require a larger percentage of my attention during different times of the year. I typically have more student meetings during “peak times” for advising appointments, and that traffic flow will usually last up until finals week, when I get the chance to switch gears and focus on half-year or annual program assessment for my office as well as strategic planning and goal setting for subsequent terms. I’m more able to engage with online professional development at these times, as well. In addition, our exploration term, which consists of four weeks in the month of January where students have the opportunity to engage in experiential learning opportunities, is another time for me to focus on these projects, since our students are away from campus and working on projects. I have a handful of large-scale projects that span all four terms (fall, e-term, spring, and summer), including strategic planning, program development, and assessment. I always find myself dedicated time to each of these initiatives, but the amount of energy truly varies. I oversaw our office’s program assessment this year, and I will likely have a hand in the process next year. In addition, building the foundation for our internship program and advising students in the process is something that I’m always working to make more efficient, so it’s an ongoing process. Building our internship program and collaborating with our partners and other departments is likely my largest project that goes on continuously. Student programming, however, often requires varying amounts of my energy – the time leading up to our Leadership Conferences as well as any other campus-wide events that our office hosts will take up the bulk of my time and energy, with much less time devoted to them at other times during the year. Same with internship advising appointments and overseeing the placement process – it gets hectic at peak times, but really slows down once students are situated for the semester. I’ve been reflecting on my life as a student affairs professional, one year out of graduate school, and have learned so much on the job already – skills and things about myself I would have expected, and many things I never anticipated. I don’t think I expected the amount of traditional “learning” I’d be doing – I thought that once my time as a student was over, that I would mostly be focused on what I was doing as a professional than taking the time to read, reflect, and continue my own learning and development. Blogging has been a large piece of this, but some bigger-picture initiatives such as piloting a seminar course within the next few semesters and offering workshops on leadership and professionalism has pushed me to want to hit the books and reflect on the literature. It’s been an enjoyable year and I can’t wait to see what our programs look like in another year! This post is part of our #dayinSA series on highlighting the diversity of functional areas in the field of student affairs. We will hear from #SApros of all kinds – academic advisors, office mangagers, res hall directors, vice provosts of SA, and many many more. Each will share exactly what their typical day looks like, what exactly they work on, and what makes them want to come to work each day. We hope to squash stereotypes within the field and celebrate all the different kinds of great work that #SApros do. For more information, check out the intro post by Sara Ackerson. Be sure to read the other posts in this series too! Kimberly White is an academic advisor to pre-nursing students at the University Academic Success Center & Exploratory Advising at the University of Alabama at Birmingham. She also serves as a Professional Development Advisor to the Pi Beta Phi Fraternity for Women, Alabama Alpha chapter. She is a recent graduate of the HESA program at Boston College and resides in Birmingham, Alabama. You can find Kimberly on Twitter at @whiteoi, on LinkedIn, or on her blog (Leadership Development and Life in the Yellowhammer State).